This maintenance set from ProShot comes complete with a Hoppe's 9 Cleaning & Maintenance Cradle and a ProShot Deluxe Airgun Cleaning Kit .177/.22 to make it a great combo for keeping your rifle in tip top condition. 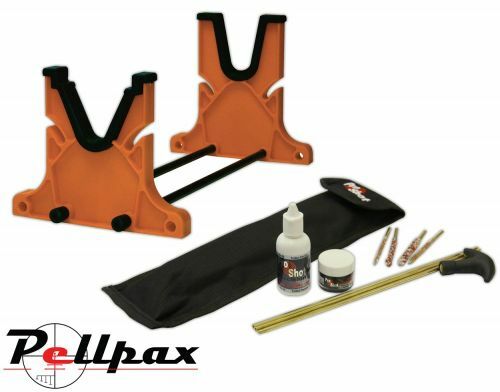 The Hoppes gun rest provides a solid base to place your rifle on whilst working on it, with the unit being extendable to accommodate all shapes and sizes of rifles, along with slots to place your cleaning rods. The cleaning kit comes complete with rods, brushes, and mops, as well as a bottle of ProShot Gun & Rifle Oil and a tub of ProShot Gun Grease, all housed in a strong holding pouch.